Amgen Tour of California organizer AEG announced the 575-mile course for the 2017 UCI WorldTour race, which will take many of the world’s best cyclists on an always picturesque, challenging and highly competitive competition through California’s iconic highways, byways and coastlines this spring. The four-day Amgen Breakaway from Heart DiseaseTM Women’s Race empowered with SRAM will bring the best in the sport to race in Northern California May 11-14, followed by the men’s seven-day stage race May 14-20. The twelfth annual edition of the men’s race will visit 12 Host Cities from Sacramento to Pasadena. Presented by Visit California, the route announcement includes a visual overview of the 2017 men’s and women’s courses at amgentourofcalifornia.com/stages. Millions of fans are expected to once again line the racecourse in May to cheer on the elite, international fields that will include Olympians, Tour de France contenders and World Champions. Fans will also have opportunities to meet and hear from cycling legends Jens Voigt and Freddie Rodriguez, who will reprise their roles as Race Ambassadors. Kristin Armstrong, the most decorated woman in U.S. cycling history, will join as a first-time Amgen Tour of California Race Ambassador, on the heels of her incredible performance to win her third Olympic gold medal at the Rio Olympic Games last summer. Local organizing committees in each of the Host Cities are recruiting fans (with and without cycling experience) to fill thousands of volunteer positions for various duties along the course. Volunteer registration is open at amgentourofcalifornia.com. Expected Outcome: This is prime territory for a group sprint with flat, fast circuits to finish the stage. Sprinters will vie to top the leader board with a stage win. Nine-time Host City Sacramento is no stranger to the Amgen Tour of California, having hosted two legendary tour starts as well as last year’s overall finish. Delivering an exciting showing every time, this year’s Sacramento leg will include the conclusion of the women’s race as well as the opening stage for the men as they begin their seven-day competition. Heading south out of Sacramento into the California Delta region, the course will be flat and wicked fast. At 104 miles, the stage has more mileage than prior Capitol City editions, including two sprints and three laps staged for speed in the shadow of the State Capitol building, guaranteed to bring an electric stage conclusion. Expected Outcome: This highly difficult stage will reveal which riders will likely be fighting it out for the overall race win. As in 2015, expect to see a handful of riders contest the last few uphill kilometers battling to the finish. Fans and riders alike will be happy the race will return to Modesto for the fifth time. After two neutral circuits at the start, the race will leave Modesto and head south to Patterson. Once through Patterson, the riders will leave the flatlands behind and start the first of six King of the Mountain climbs (KOMs) up Del Puerto Canyon. Three additional KOMs will start to sap the strength of many in the peloton. The true climbers will save themselves for the HC climb up and over Mt. Hamilton. This stage set the table for the GC riders in 2015, and you can expect the same this year. The technical descent down Quimby Road collected several riders in 2015. A short, but demanding climb will await the leaders as they ascend to the finish at the Santa Clara Motorcycle Park. Riders will climb about 9,000 feet during the stage, as well as contest two sprints. After missing last year, San Jose will return as a Host City for the eleventh time, an all-time race record. Expected Outcome: A flat course with an uphill finish, this stage should find the sprinters ready to pounce. Two-time Host City Pismo Beach returns this year, and the aroma of clam chowder and the sound of crashing waves will be the sendoff for this nearly 115-mile stage. The riders will enjoy a little of everything they have come to expect from California: beaches, sand dunes, vineyards and wineries, a little climbing, lots of spectators, and lush countryside. Guadalupe, Orcutt, Nipomo, Arroyo Grande and San Luis Obispo will all welcome the riders as they head back to the coast and a finish in Morro Bay, which became a very popular start city in its first showing last year. Riders will encounter one KOM, two sprints, and a nasty little .5 km climb to the finish. Expected outcome: After a day full of moderate climbing, expect a massive sprint down the long and straight finish. With warm breezes coming off the beach across from the start line, it will be just as difficult to leave Santa Barbara as it was in 2015 when the riders took the same route into Santa Clarita. Winding through Montecito and Carpinteria, the riders will be getting their legs ready for two short but steep KOMs as they approach Lake Casitas. A fast descent down Hwy 150 will take them alongside the lake and into Ojai. Following another KOM up Dennison Grade, the race will return to the picturesque town of Santa Paula, where the base of Balcom Canyon looms just a few miles away. Following a “white-knuckle” descent of Grimes Canyon, riders will head through the orange groves near the small town of Piru, and the race will begin its 13-mile eastward push on Hwy 126 toward Santa Clarita. A prevailing tailwind will help keep the race together, and the crowd waiting in Santa Clarita should see another massive field sprint. This stage comes in at more than 100 miles with two sprints, four KOMs and 7,700 feet of climbing. Host Cities for the eighth and ninth time respectively, Santa Barbara and Santa Clarita are home to some of the state’s most avid cycling communities. Expected Outcome: Good chance the race will stay together until the final three miles when a small group is likely to attack the summit, and the best legs will win the day. The winner of the 2017 Amgen Tour of California could be decided on the final 15 switchbacks to the finish atop Mt. Baldy. It’s been called the “Queen Stage” and compared to the epic stages of the European Grand Tours. The training ground for many local Southern California riders, the race will return to the mountaintop finish that thrilled fans in 2011, 2012 and 2015. Only a handful had done the entire route, but after the race contested the climb in 2015, this is now one of hottest Strava segments in the U.S. The race will begin at the Ontario Convention Center, marking the third time Ontario has hosted a stage culminating at Mt. Baldy. This year’s route will head north into Upland. From here, the riders will start an 11-mile climb to the Village of Baldy. After an acute left, the racers will face another mile of climbing up Glendora Ridge Road to their first of three monster KOMs. From there, they will face 12 miles of narrow and twisting roads that gradually lead to a fast and technical descent down the backside of Glendora Mountain Road. 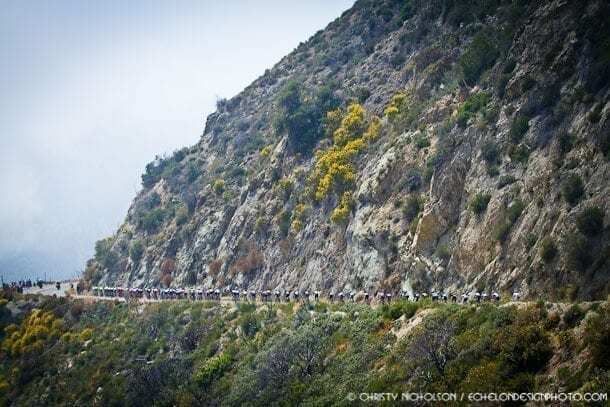 Riders and fans alike can expect spectacular vistas throughout the Angeles National Forest. Another descent down East Fork will take the riders to Highway 39 and the town of Azusa. Heading east, they’ll race through the outskirts of Glendora. A left turn onto Glendora Mountain Road (known by locals as the infamous “GMR”) will invite the peloton to a grueling 9-mile climb to the second KOM of the day followed by 12 miles of a slight climb back to Baldy Village. A left turn back onto Baldy Road will see the race gain 1,000 feet in just two miles… but the real climbing will be yet to come! At Ice House Canyon, the route will make a hard left turn where the sign to the ski area points toward the sky. Over the next 2.5 miles, the riders will face 10 switchbacks on a road so steep many of the race vehicles cannot make it to the top. With 1.2 miles to go, the road will straighten and the finish will be visible ahead. At .25 miles to go, the route will make a hard left and the racers will face the final five switchbacks to the finish line, where legends are made. The stage will include two sprints, three KOMs and a massive 12,000-foot elevation gain. Expected Outcome: The course is flat and fast, but the mountain elevation will take its toll on the riders. Especially if the overall race is close, the leaders, who will be last to ride the course, will do everything in their power to earn precious seconds. At 6,752’ and featuring one of the most beautiful lakes in California, the City of Big Bear Lake will welcome spectators for the third time – this year for the fan-favorite Individual Time Trial stage, where racers will take off one at a time, riding against the clock for the best time of the day. The course will begin in the heart of the Village in Big Bear Lake. The first three miles of the route wend through a residential section along the south shore of the lake. Taking the Stanfield Cutoff across the lake, the course will turn left, continuing on Hwy 38 to the town of Fawnskin. As the riders turn back toward the City of Big Bear Lake following essentially the same route back into town, they can expect large crowds in Fawnskin. Heading right onto Big Bear Blvd. with just .6 miles left, the riders will then turn right onto Pine Knot Ave., through a narrow stone archway and onto a 1,000-foot jetty. For riders pushing their physical limits, the finish line will very close to the water’s edge! This is very flat and fast course. Don’t expect riders to score huge time gaps over their rivals to take a big lead into Stage 7. Expected Outcome: Teams will ride to protect race leaders through this mostly downhill stage punctuated by moderate climbs. Expect an electrifying group sprint finish to close out the 2017 race. What would the Amgen Tour of California be without a quick tour of the Angeles National Forest. Often called Los Angeles’ “backyard,” this will be the race’s 13th visit to this iconic California gem! Starting at the Mountain High ski resort and finishing in Pasadena (second and fifth visits respectively), there will be a lot of downhill to this stage. Not to worry, the action will come on strong with two sprints and three KOMs with 6,400’ of climbing. The final stage will eventually descend into the City of La Cañada Flintridge and the outskirts of Pasadena. As in 2014, the winner will be crowned in the heart of downtown Pasadena on Green Street in front of Convention Center. The finish will feature a long straightaway that will allow the teams to launch their sprinters. It should make for an incredible finish to the 2017 Amgen Tour of California. Expected Outcome: Expect a select group fighting their way to the finish with riders coming in over the next 5-10 minutes. Not a particularly difficult stage, but with just two climbing stages, riders will try to get some separation and build on the gap going into Stage 2. What better way to start a WorldTour event? The fans and racers can’t seem to get enough of this epic road race and world-class race course, which they contested at the start of last year’s event. The 2017 race will start and finish at Heavenly Mountain Resort. The route will circle Lake Tahoe in a clockwise direction, passing through South Lake Tahoe, Emerald Bay and Tahoe City. As the riders reach the north shore of Lake Tahoe, they will enter Nevada and ride through Incline Village. The stage will feature two sprints, 5,300’ of elevation gain and two Queen of the Mountain (QOM) climbs. The final climb will be a brutal ascent back to the finish at Heavenly Mountain Resort. Lake Tahoe is known for its natural wildlife and outdoor enthusiasts, so fans will likely be watching from boats, paddle boards and bikes. Expected Outcome: This is a very difficult stage with two large climbs and an uphill finish. Expect a group of 5-10 fighting their way to the finish with riders trailing in for the next 15 minutes. A new road racecourse awaits the women for Stage 2. The racers will return to Heavenly Mountain Resort for the start, heading west and then south on CA-89. This will take them over the 7,740-foot summit of Luther Pass where they will contest the first of three QOMs for the stage followed by a quick descent into the spectacular Carson River Basin. The route will then take the riders on a loop through the Washoe Reservation before heading northeast into Nevada. A left turn will take them north on Kingsbury Grade. The “Grade” has never been attempted in any previous Amgen Tour of California stage. This is an 8-mile climb that gains 2,700’ in elevation. The second QOM will come at an elevation of 7,400’. The descent back to South Lake Tahoe will provide many beautiful views of the lake and the surrounding mountains. The final QOM of the stage will await the riders at the finish at Heavenly Mountain Resort. Expected Outcome: Flat, fast and primed for a group sprint to the finish. The race welcomes the City of Elk Grove as a first-time host. After a neutral circuit through the Elk Grove Regional Park, the race will head west and then south to the Sacramento River and the California Delta region. This will be a very fast and flat race route that should guarantee a day for the sprinters (including two Sprints along the way) and an exciting finish at the Capitol building in Sacramento, where some of the most exciting stage finishes in Amgen Tour of California history have unfolded. Expected Outcome: On these very fast circuits, teams will protect riders in contention for the overall win and set up on the final lap for a massive sprint finish. The Capitol Circuit Race has quickly earned the reputation as one of the fastest and most technical courses in the country. This flat 2.2-mile course features six turns. It encompasses the Capitol building and passes by several other notable state government buildings. The 90-minute race will include 20 laps of the circuit, beginning shortly after the men depart the course to begin their seven-day event.